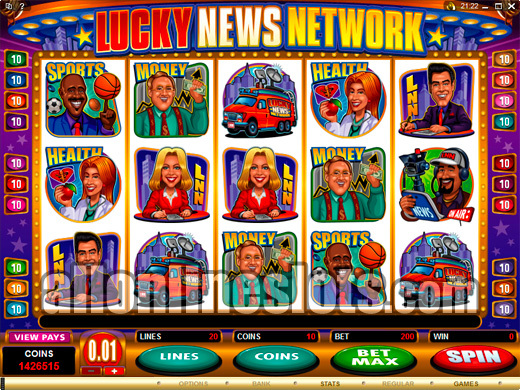 Lucky News Network is a five reel, twenty line slot machine with a TV news theme. It has coin sizes starting at a penny and max bet is 20 coins per line. Top jackpot during normal play is 2,000 coins and there is a free spin and pick a box bonus feature. 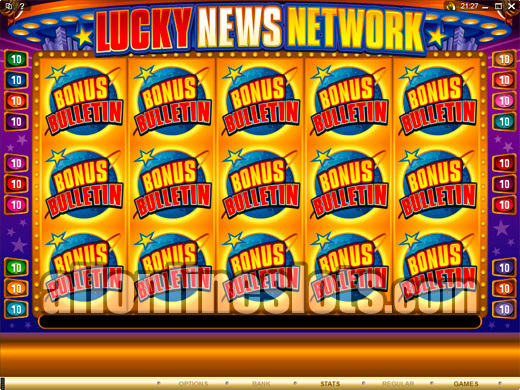 Lucky News Network is a 5 reel, 20 line slot machine from Microgaming. As the name suggests it has a new channel theme with a range of symbols like reporters, camera men and news vans all appearing on the reels. Like most video slots the game has a bonus feature. 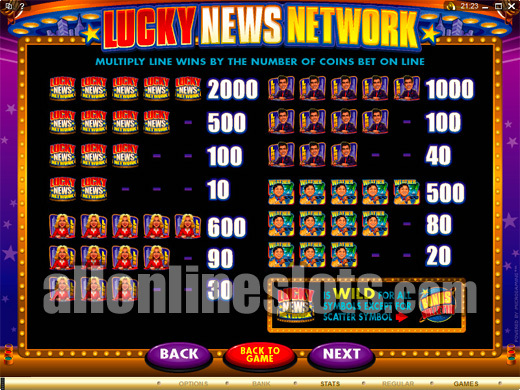 Coin sizes on Lucky News Network range from 1c to 25c and maximum bet is 400 coins per spin. While you can bet up to 20 coins per line you could quite easily play this game at just one coin per line without missing out on any of the games features. Of course the more you bet the more you can win. 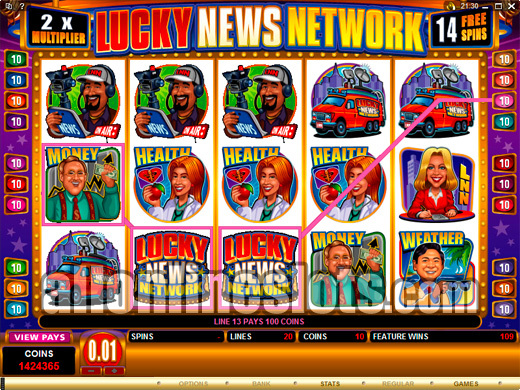 Speaking of winning, the top jackpot on Lucky News Network is 2000 credits. This is won by lining up five of the wild logos. The wild logos act like a joker for all symbols except the scattered Bonus Bulletin symbols. While 2000 coins might seem like a small jackpot you can win up to 40,000 coins for the top combination if you are playing the maximum 20 coins per spin. After the jackpot the next three highest pays are 1000 credits for five anchor men or five scattered Bonus Bulletin symbols these are followed by 600 and two ways to hit for 500 coins. In total there are 37 unique winning combos. The Bonus Bulletin symbols are what you need to start the bonus stage. Instead of needing three or more you simply need on e of reel 1 and one on reel 5 at the same time. Once you have activated the feature you move on to a second screen where you have 15 symbols to choose from (Screenshot). There are several possible outcomes on the bonus. With each pick you can either win a credit prize or free spins. Some of the picks can award additional picks so if you are lucky you can get a few picks before the bonus ends. The best possible outcomes are 20 free spins with all wins X5 or 157X your total bet. If you get the max instant win at 400 coins you win 62800 credits. If you like a bit of mystery with your slots then this might be the games for you because you never really know what you are going to get once you hit the feature. If however you are a die hard free spins fan then this game might be a bit frustrating as we only got the free spins once out of eight bonus games.